FRESNO, Calif. -- Fresno Police Chief Jerry Dyer said 16 shots were fired in less than two minutes, killing 3 people. The suspect, 39-year-old Kori Muhammad is in Fresno Police custody Wednesday morning after a shooting rampage in Central Fresno. Investigators say Muhammad opened fire at a PG&E work truck around 10:30 Tuesday morning near Fulton and Van Ness -- killing 34-years-old Zackary Randalls in the passenger seat. The victim's co-worker drove him to police headquarters. Randalls was already dead. Muhammad kept walking, shot at another man but missed, police say. Police say he then found another victim, 37-year-old Mark Gassett on Fulton Street north of Nevada Avenue. He then reloaded at the bus stop, police say, and killed 58-year-old David Jackson in the Catholic Charities parking lot. One witness who heard those gunshots said he rushed out of house, which is just a few doors down, and saw one of the victims drop to the ground. "I saw the second and third shots. The guy was on his way down to the ground when he fell. I felt for a pulse and not that I know what I'm doing but I couldn't find one and someone turned him over and he was very obviously dead," said Aaron Van Curen. Muhammad then ran into the arresting officer at Fulton and Divisadero. He shouted "allahu akbar" as he was taken into custody. Fresno Police say Muhammad was on their radar in connection with a Motel 6 murder last Thursday. They say this shooting spree may have been triggered after they released his name as the wanted suspect in the death of security guard Carl Williams. The 25-year-old was shot and killed while responding to an incident at the motel Muhammad was visiting. Chief Dyer says surveillance video shows Williams' murder and the attempted shooting of a second security guard. Dyer says based on surveillance video they were able to identify Muhammad. 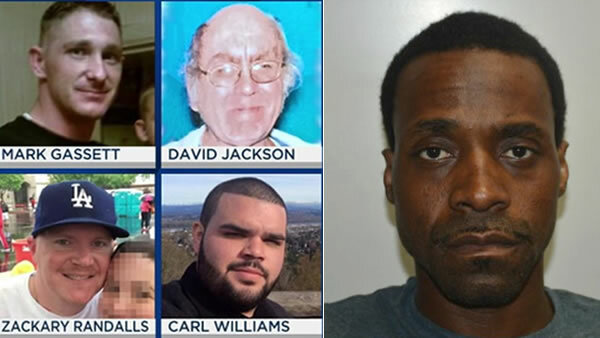 Chief Dyer said after Muhammad learned he was wanted in connection with the Motel 6 murder he decided he would kill as many people as he could before going to jail -- adding he believes this was racially motivated based on social media posts. Police say the first person gunned down was PG&E utility worker Zackary Randalls, who was sitting in the passenger seat of a work truck. He was a 34-years-old father and it was his first day out in the field. Nick Stavropoulous, the president of PG&E, spoke about the loss. "All of us at PG&E are devastated by this unbelievable act of violence today. This random act of violence. We lost a member of our family. It's hit us all very hard." Click here to donate to the memorial fund for Zackary Randalls. The second person killed was 37-year-old Mark Gassett who was gunned down on Fulton Street. He is a husband and father of two. Click here to make a donation to his family. David Martin Jackson, 58, was shot and killed outside of the Catholic Charities office on Fulton Street. Investigators say Muhammad is responsible for a fourth death, 25-year-old security guard Carl Williams, who was shot and killed late Thursday night. Click here for full coverage on the Fresno shooting spree.